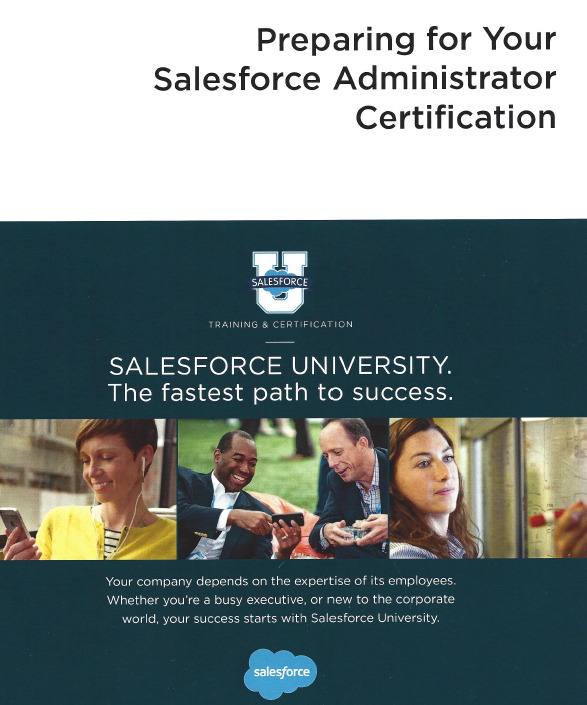 It’s my understanding that Salesforce launched CRT101, "Preparing for your Salesforce.com Administrator Certification." last year at Dreamforce. It’s a 1-day class and costs $850 per student (plus tax by the way!). I had received an email from certification@Salesforce.com on December 29, 2014 with the subject line "Salesforce Certified! Has a nice ring to it, right?" The email went on to explain that you can attend a one day class, on a Monday, Tuesday or Wednesday, and then sit for the exam on a Thursday or Friday (though you could schedule the exam for a later date if you needed extra time to study). The exam voucher ($200) was included in the price of the one day class. It also mentioned that non-profits get 50% off the class – bonus! You can go to Salesforce.com to see the schedule of training class cities and dates. It was fortuitous timing as I has two new folks on the team, and though they both had 4+ years working on Salesforce in an System Administrator and business analyst capacity, they had never taken the exam. Having worked with both of them, I knew they were ready to take the exam (or very close), yet both were apprehensive. Over the years something I’ve seen on many occasions are individuals over-studying or wasting time studying areas of Salesforce that they have mastered. When considering taking a Salesforce exam, you really need to focus on the exam objectives and plan accordingly. 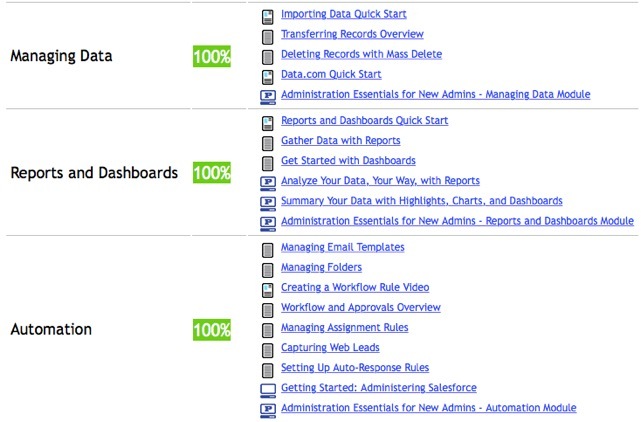 With Salesforce certifications you are shooting for "pass," not an "A." When you finish the test and click "submit," you’ll never know how well you did besides a "pass" or "fail" on the screen. 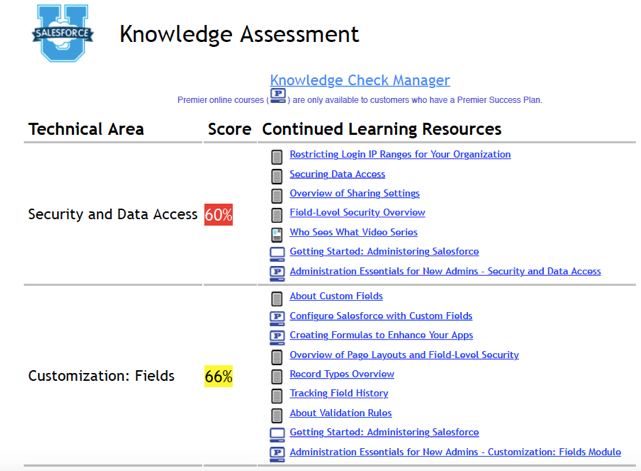 On the Certified Salesforce Administrator exam you get 90 minutes for 60 questions and a passing score is 65%. I applauded both of my folks for wanting an "A" (that’s why they are good consultants! ), but I needed them to focus on the true goal – passing the exam. My objective for spending $850 on my new folks was to get them past the mental block that they were not ready and give them some concrete affirmation that they were in good shape to sit for the exam. In short they needed confidence. I reached out to one of my Salesforce instructor peeps in the Dallas area to get her take on the new class and also to confirm there would be some practice questions as well (as the pdf on the class does not tell you much). The good news was that at the end of the day, at about 3pm, there is a 20 question mock exam with 30 minutes to take the exam. Perfect! Both enrolled for class in Dallas for the week of January 19th. Class participants also get a nice spiral bound ~45 page booklet as courseware. By the time the practice test rolled around that afternoon both were a bit mentally exhausted, but they did well on the test (and better than some folks that had just taken the 5-day ADM 201 class – so don’t underestimate hands-on experience!). After the exam the instructor goes through and explains the correct answers. Class participants are also emailed a Knowledge Assessment that tells them their score by "Technical Area" with links to additional resources for that topic (very cool!). I see the Knowledge Assessment as a huge benefit for taking the class as a student can then really focus on their shortcomings. So, how did they do on the test? Both passed – mission accomplished! My take on the class (through my folks), is that the class is a good measure on where you’re at with your exam preparation. The mini test with 20 good questions (not the junk you find out on the internet – beware there is a lot disinformation out there) and the accompanying Knowledge Assessment are invaluable. If your looking for a gut-check on your exam readiness, I think CRT101 is an option worth considering.